In 2006, there was a prosecution in the UK for an offence relating to an illegal landfill site. This was a major criminal operation and the rubbish that was burnt caused a mound of ash that was 3 metres thick and measured 260 metres in circumference. At trial, the Environment Agency stated that this offence took place between May 2005 and January 2006. The two images at the top, dated October 2005, appear to show, in the circled area, the burning of waste on this land during the already known time of the offence. The two images at the bottom, dated June 2004, were taken nearly a year before the Environment Agency believed the offence was committed. These appear to show a large burned area on the land at this time and might be evidence that the illegal activity had been ongoing for a longer period of time than the investigators previously thought. 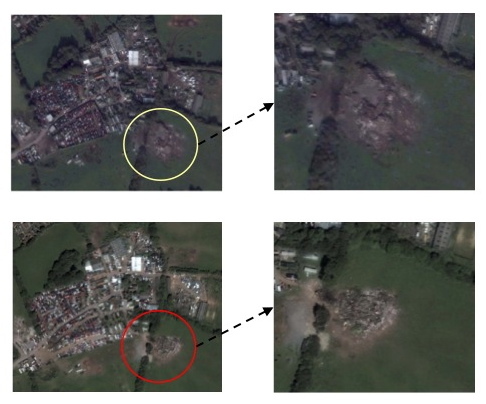 This highlights the practical function of imagery archives for prosecuting authorities. If they had access to such imagery, then they might have used this in court to press for a harsher sentence. Image Copyright: © DigitalGlobe Inc. Images kindly provided to us by DigitalGlobe Inc. These two separate low-resolution satellite images were used by a State enforcement agency to show illegal vegetation clearance in Australia. There are clearly a large number of trees in the middle of the image on the left. The image on the right, which was taken at a later date, reveals that these trees were removed, without as it turned out, legal permission. Below images. Copyright: © CNES, Distribution Spot Image. Images were kindly provided to us by the New South Wales Government (and kindly allowed to be use by Spot Image). The two images below provide a further example of where EO has been used to demonstrate illegal vegetation clearance in Australia. The image on the left, which is from an aerial photograph, shows five individual trees in the marked circles that were present on the land in 1999. The image on the right, taken from a high-resolution satellite image in 2001, shows that two of the original five trees (circled 4 and 5) are now clearly missing. These images show that the trees were removed illegally. Below images. Copyright: [left] © Queensland State Remotely Sensed Image Library [right] © GeoEye Inc. 2009. Images kindly provided to us by the Queensland Government and allowed to be used by us via the kindness of GeoEye Inc.
Insurance investigators charged a couple in New Orleans with insurance fraud after satellite images taken immediately after Hurricane Katrina revealed that the damage to their house actually occurred after the Hurricane. Reported by the Louisiana State Police (Insurance Fraud and Auto Theft Unit in 2007). The image is of the broken 17th Street Levee in New Orleans, LA, following Hurricane Katrina (not the house in the insurance claim). Image Copyright: © DigitalGlobe Inc. The Environmental Law Alliance Worldwide became aware of a construction of a waste landfill in Philippines, that was considered to be in a poor location because it was in a low-lying coastal area that was extensively covered with mangroves. The environmental examination report of the landfill company made no mention of the loss of mangroves so the Environmental Law Alliance Worldwide used Google Earth to provide evidence that an extensive canopy of mangroves that would be cleared if the landfill were constructed: The yellow line on the satellite image indicates the boundaries for the proposed landfill. Image Copyright: Google. Image © Mapabc.com. GeoEye, Kingway Ltd. In a case in the UK, a defendant was found guilty of keeping approximately 50 scrap vehicles in an illegal scrap-yard without a waste management licence. The offence was originally discovered by the Environment Agency following a ground inspection. The offence above occurred between June 2004 and September 2005 and the offender was given a set-period of time in which to comply with a court order to remove the illegal vehicles from the scrap-yard. Satellite images, dated May and June 2005, show that there were scrap cars stored on the site during the time of the offence. Of greater interest in the compliance context is the satellite image taken of the site on February 2006, after the date for compliance with the court order. This image shows that the vehicles appear not to have been removed from the site and that the court order might not have been complied with. A closer examination of the image also reveals that the illegal activity might have actually intensified, as it appears there are more cars on the site. Although they were not actually used by the authorities in this case, EO technologies might, therefore, under certain conditions, be used by regulators to check legal compliance as part of a risk-based enforcement strategy. This could include monitoring sites with a high-risk of offending or a defendant’s performance after a successful prosecution; for example, checking on any subsequent clean-up operation. The U.S. Department of Agriculture helps farmers manage their risks through the Federal Crop Insurance Program. Satellite technology can be used to monitor when a farmer plants his acreage, irrigation methods, and what crops he decides to grow. If changes or suspicious images are found in a farm’s insurance claim, investigators review satellite photos dating back years to determine cropping practices on individual fields. They can also support a producer’s claim of an insurable loss – a situation where the forces of disease, drought, and weather looked out of the norm. One large case of insurance fraud was in North Carolina where a tomato farmer and his wife were involved in a crop fraud scheme at some tomato growing farms. Eight people were convicted. The ringleader was sentenced to 76 months in prison, his wife to 66 months. They were also ordered to forfeit $7.3 million and pay $9.15 million in restitution. Satellite imaging was used during the trial, helping the Agency to nail down the convictions, according to the Associated Press. Image Copyright: © USDA Farm Service Agency. The US in July 2014 released satellite images it said backed up its claims that rockets have been fired from Russia into eastern Ukraine and heavy artillery for separatists has also crossed the border. A four-page document released by the State Department seemed to show blast marks from where rockets were launched and craters where they landed. Officials said the images, which were sourced from the US director of national intelligence, showed heavy weapons fired between 21 July and 26 July, after the 17 July downing of Malaysia Airlines Flight 17, over eastern Ukraine. In 2013, Defenders of Wildlife used satellite photos to document unauthorized oil and gas development in habitat for the dunes sagebrush lizard, one of the rarest lizards in North America. The habitat was supposed to be protected by a conservation plan between the Texas Comptroller and the U.S. Fish & Wildlife Service. The satellite images showed new oil drilling pads, dirt roads, and other land clearings after the protection agreement was in place. Image Copyright: Google. Image © Landsat 8, USGS. The Satellite Sentinel Project (SSP) and Amnesty International (Eyes on Darfur) have been using imagery to monitor human rights abuses in Sudan and South Sudan since December 2010. Satellite images have shown military outposts and troop movements, and provided evidence of mass graves and the destruction of villages. See more at http://www.satsentinel.org and www.eyesondarfur.org. Imagery Copyright: © DigitalGlobe Inc. Imagery Copyright (above): © DigitalGlobe Inc.; Analysis: The Satellite Sentinel Project. A ship near the lower left corner of the image is seen on the satellite image to be discharging the oil into the sea – the plume is 5 km in length. This is possibly the first ever remote sensing image accepted as court evidence for oil pollution investigation in the world. Imagery Copyright: © ESA 1996. This imagery shows extensive destruction of homes and other property in a predominantly Rohingya Muslim area of the coastal town of Kyauk Pyu – one of several areas of new violence and displacement. Human Rights Watch identified destroyed structures following arson attacks The area of destruction measures 35 acres and includes 633 buildings and 178 houseboats and floating barges adjacent on the water, all of which were razed. There are no indications of fire damage to the immediate west and east of this zone of destruction. Imagery Copyright (above): © DigitalGlobe Inc. 2012; Analysis: Human Rights Watch (HRW). Satellite imagery has shown the unlawful demolition of thousands of residential buildings in Damascus and Hama in 2012 and 2013, according to Human Rights Watch. The first satellite image shows the Mezzeh area of Damascus in February 2013. The second image shows the same area in July 2013. The extensive damage over less than six months to these high-rise residential buildings is visible along this main road in the suburb of Syria’s capital. The third satellite image shows hundreds of damaged buildings and impact craters following the weeks-long government shelling of a neighborhood in the Syrian city of Homs. 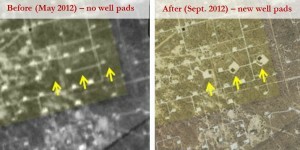 This satellite image is overlaid with red circles to show destroyed or damaged buildings and yellow circles to show impact craters in open areas such as fields or roads. Human Rights Watch found that 640 buildings had been visibly damaged and at least 950 craters pocked the area. Imagery Copyright: left - © DigitalGlobe Inc. 2012; right - © CNES 2014.